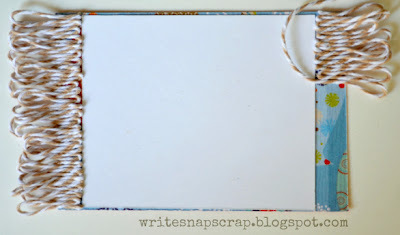 I’m so happy today to be posting a fun summer project made with two of my favorite things: Trendy Twine and Little Yellow Bicycle's Splash collection from the August kit at My Creative Scrapbook. I have two cards up today: a boy card and a girl card. Let’s start with the boy version. Aw, now don’t those flip flops look lonely? They make me want to run over, drop my sandals next to his, and relax at the beach. The little towel was really easy to make. 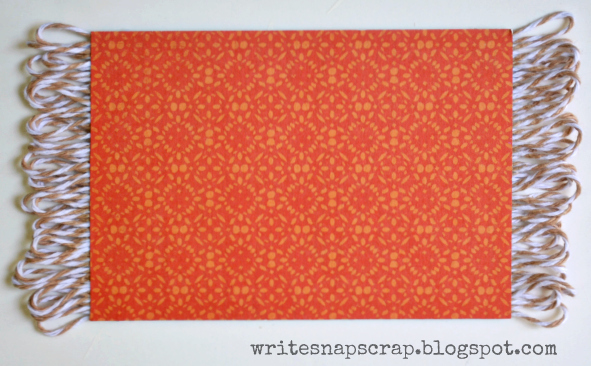 I started with a rectangle of patterned paper, approximately 4 x 2.5 inches. On the back, I added a piece of cardboard that was a bit shorter than the towel on each end. This gave me a guide for where to put the twine and also helped raise the towel to the same thickness as the twine so it would sit even on my card front. On the back of the towel, I used my ATG to run a couple strips of double-sided tape where the twine fringe would be. Then I added the twine, looping it tightly together. The twine I used was Krazy for Kraft. It's a versatile khaki color from Trendy Twine that folds very nicely for this purpose. This view shows the front side of the towel after I had added the twine, but before I trimmed the fringe with scissors. 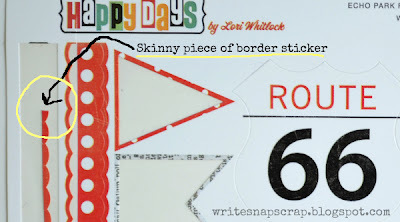 I thought the card needed a little edging by the fringe, so I added a scallop border sticker from an Echo Park Paper element sheet. 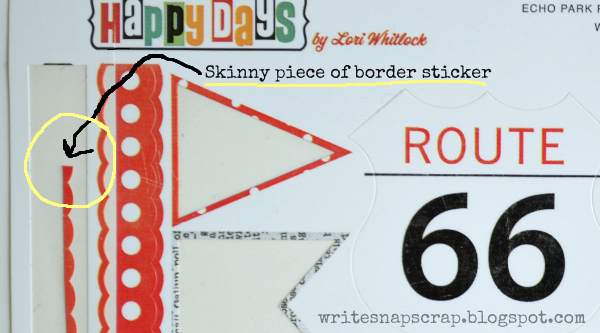 The border strip was much wider on the sticker sheet, but I cut it down to a very narrow strip. 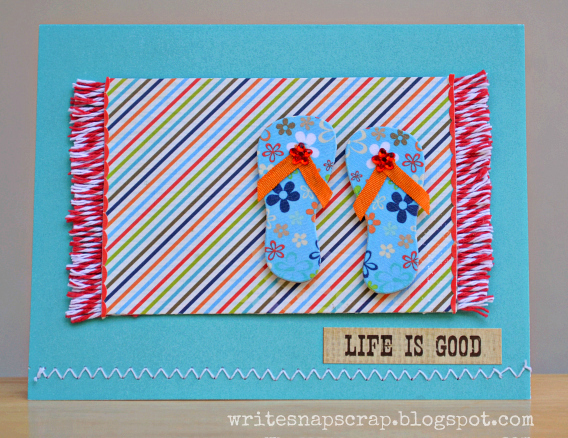 Then, I added flip flops and a sentiment. I got the idea for the card from this pin on Pinterest. For the girl card, I followed the same process, this time using Berry Red twine. For more ideas on using twine and for information on our August challenge, please visit the Trendy Twine blog. So cute! I love the twine on the towels. I love it! LOVE that use of twine!!! So adorable!!! OMYGOODNESS!!! I just loveeeeeeeeeeeeee these!! The towels are just AMAZING and I am LOVING those little flip flops!!!! GORGEOUS!!!! Adorable! What a fun technique and so super cute. That is so adorable. Love the twine! Oh my gosh. This is just to stinkin' cute! OMGosh...those are the cutest! Love the fringe on their beach towels! Awesome idea-but a day late lol. 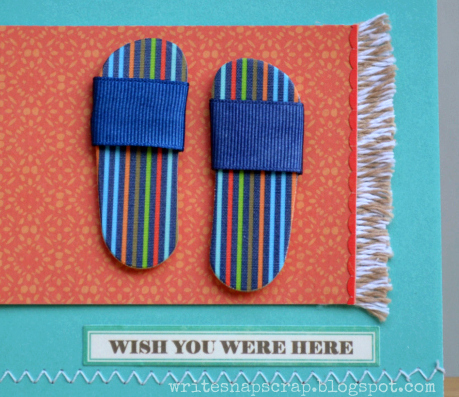 I just added a "towel and flip flop" to my mini album page. I cheated, i used a premade layered sticker. How cute are those? I just pinned that first card-I want to try to work that beach towel into a layout. Love Love Love it, especially the girl version, it turned out so super cute. Great use of the Trendy Twine on your project. So inventive! 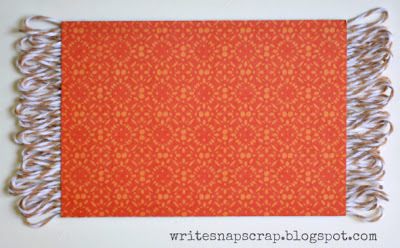 Love the way you worked this twine! I love this idea! Thanks for showing us how to do it! These are so fun, Izzy. Love the girl card! 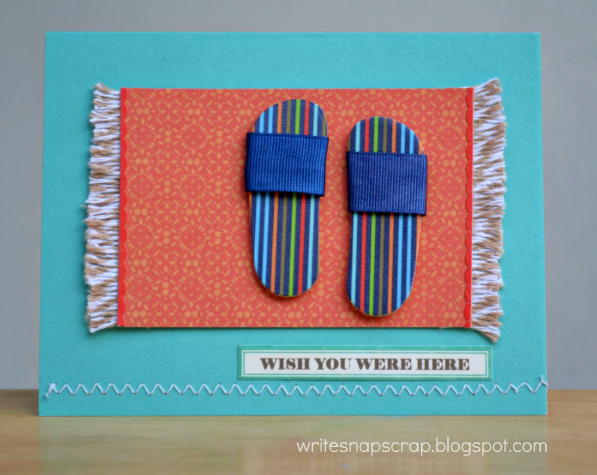 Such great cards, love the fringe idea, such a creative use of twine! Great cards and thanks for the step by step on the fringe/ twine. Adorable! I love them so much!!! You have such a fun creative style, Izzy! I have always loved your work! And thanks for your visit to my blog, too! So cute, and I loved seeing how you got to the final result! So super cute! Thanks for the easy instructions. So cute...what a cute idea!